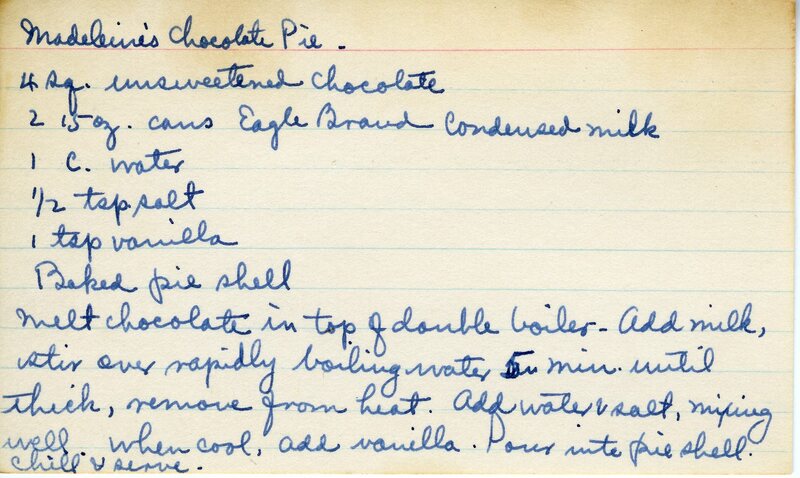 This is surely a recipe from Gram’s friend Madeline, the doctor. Clearly she wasn’t much concerned with healthy eating as we are today. It makes me wonder sometimes if we are so focused on what we eat that we are making ourselves fat. Eat and enjoy life in moderation, right? When we deny ourselves something like chocolate pie, we may find ourselves coming out of a food coma with the empty pie tin on our laps and chocolate filling around our mouthes. Note, my Mom thinks we probably don’t have to use the double boiler as our grandmothers did. In this case, do your cooking over a low or medium heat and watch it closely so nothing scalds or burns. Melt chocolate in top of double boiler. Add milk, stir over rapidly boiling water 5 min until thick, remove from heat. Add water & salt, mixing well. When cool, add vanilla. Pour into pie shell. Chill & serve.